The gold pan is crafted by placing a ceramic bowl in the crafting grid. The gold pan is used to gather native ore nuggets. To use the gold pan, right click on the top of a sand or gravel block anywhere in the world, except underwater. Note: Gravel and Sand blocks that are underwater must be dug up and placed on dry land before they can be used to fill the pan. The pan will fill, and there is a 10% chance that the gravel/sand block will be consumed. The gold pan can be filled 50 times in a chunk, after which attempting to use it will result in a chat message stating, This area seems to be overworked. You probably wouldn't find much. Once the pan is filled, right click on the top of a block directly under flowing water to use the pan. The pan can be used 5 times before it will empty. 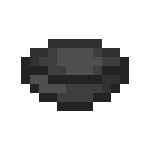 With each use, the pan has a chance to give the player a native ore nugget, or nothing at all. If the pan does produce an ore, the chances of which one it produces are most likely to be copper, then gold, and finally platinum. Gold pans can sift gravel, sand, dirt and clay. Gold pan acts as a sluice light by scanning an area roughly 50m around itself and 35m deep. Gold pan can be used to add soil to a sluice. Removed gold pan use on dirt and clay. Gold pans have a max stack size of 1 in order to prevent an exploit. Overhauled gold pan. Pan can only be filled so many times in a chunk. Panning no longer scans the world as a prospecting mechanic. This means that no matter where you pan, you will only be able to find nuggets of the native ores. Gold Pan operates on a chunk grid which determines the types of metals available. Chunks have a 75% chance to contain copper, 50% silver, 25% Gold and 100% Platinum. Maximum panning per chunk reduced from 100 to 50. Silver removed from panning to slow the progression straight to bronze. Filling the pan from underwater blocks disabled. Just like when using any other tool, filling the gold pan uses up hunger. If the language is set to Canadian English and the player attempts to fill a gold pan in an overworked chunk, they will get a chat message stating, Sorry, this area seems to be overworked. You probably wouldn't find much. This is a joke on stereotypical Canadian politeness and constant apologizing. This page was last modified on 8 June 2015, at 22:29.